The hotel occupies a narrow strip of land bordering the beach and has a long paved terrace with a swimming pool and sunbathing area running down to the sandy beach. 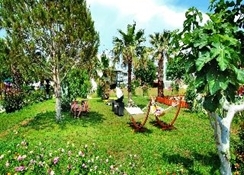 To one side of the terrace is a grassy area. Comprising a total of 133 guest rooms, the air-conditioned establishment welcomes guests in a lobby with 24-hour reception and check-out service. 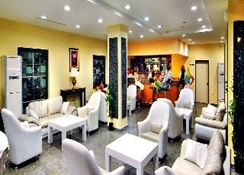 The hotel's facilities include shops, a hairdresser, lifts, a children's playground, kids' club and a games room. There is a public Internet access and WLAN access point in the hotel. It also features a hotel safe, currency exchange facilities, a cloakroom and a TV lounge. 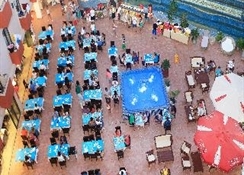 Guests may dine in the cafï¿½ or restaurant and sip their favourite drinks in the bar and disco. Business guests are sure to appreciate the conference facilities. For additional fees guests may make use of the laundry service and bicycle hire. Those arriving by car may leave their vehicle in the car park.